ST. AUGUSTINE, Fla., April 29, 2009 -- Northrop Grumman (NYSE:NOC) employees today celebrated the delivery of their 44th modified F-5 Tiger for the U.S. Navy. In a ceremony at the company's East Coast Aircraft Manufacturing and Flight Test Center, officials from NAVAIR PMA 207 accepted the delivery of the final aircraft under the current Navy F-5 Acquisition/Re-capitalization Program, which provided for the modification of 44 Swiss Air Force aircraft into 41 F-5N's (single-seat aircraft) and three F-5F's (two-seat trainers). "The transformation of these formerly Swiss-owned fighters to U.S. Navy assets was a smart, strategic, and cost-effective move," said Capt. James Wallace, PMA 207 program manager. "It speaks to the entire team's effort that all of the aircraft were delivered on cost and on schedule. 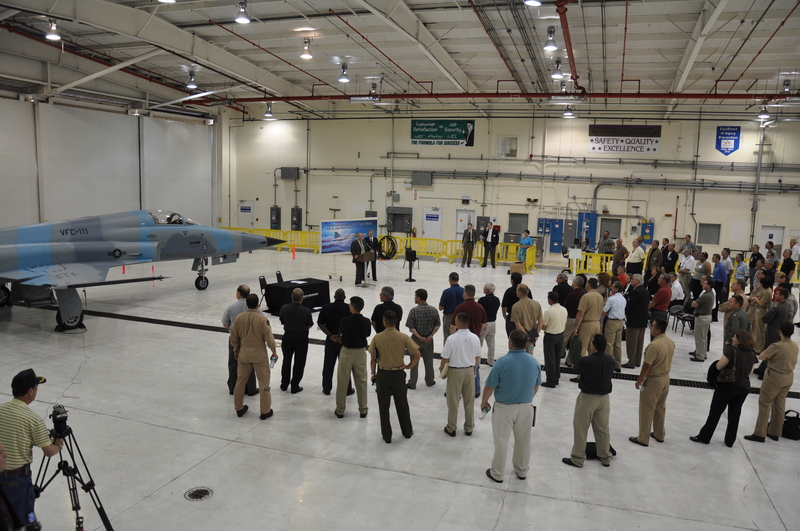 The objective of this program was to achieve a cost-effective solution for providing our naval aviators with real-time, hands-on training to simulate enemy aircraft in aerial combat training exercises, which only platforms like the F-5 can deliver. Clearly, we achieved that goal." 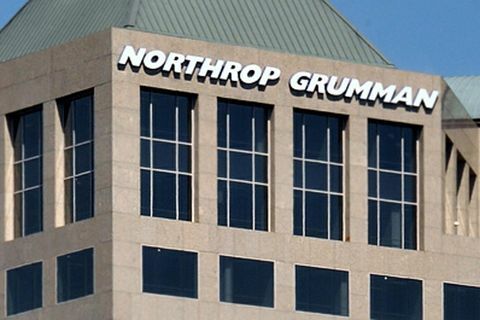 "The team's ability to deliver on our contract commitments is a testament to the talent of our U.S. Navy/Northrop Grumman team to get the job done. 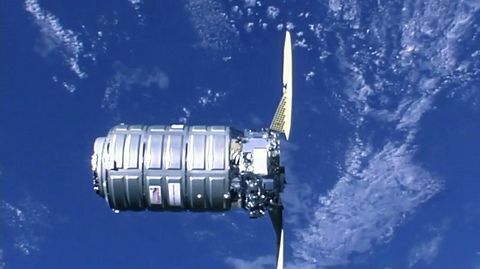 As the original manufacturer, our generations of experience in building new, and modifying existing, military aircraft greatly benefited our Navy customer," said Rick Matthews, Northrop Grumman vice president for east coast production operations and St. Augustine site manager. "We have supported the global F-5 fleet for more than 40 years." The F-5 is an agile, highly maneuverable, reliable supersonic fighter, combining advanced aerodynamic design, engine performance and low operating costs. A highlight of the effort, according to Matthews, included the conversion of three single cockpit F-5E aircraft to dual cockpit F-5F aircraft. 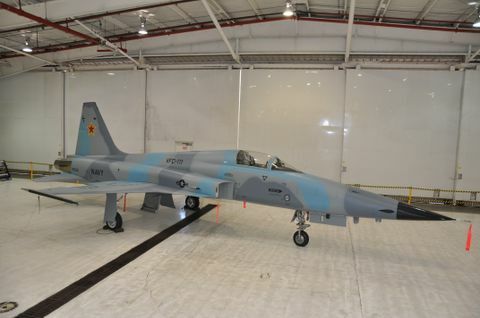 "This conversion replaced the F-5E forward fuselage with a refurbished F-5F forward fuselage at the basic manufacturing attachment assembly point," Matthews said. "It was a monumental task completed by outstanding craftsmen and women." "The company has long had the expertise to maintain and enhance the structural integrity of the F-5 airplane to ensure satisfactory, cost-effective structural integrity for the newly extended service life and at the more severe operational spectrums anticipated by countries operating the F-5," Matthews said. Since 1999, Northrop Grumman has been under contract to the U.S. Navy to perform depot level maintenance for the Navy's fleet of F-5E/F aircraft. This phased depot maintenance program provides structurally sound F-5 aircraft that will operate safely in the severe spectrum associated with the adversary role of the F-5 fleet. "Today, we are focused on a total system support plan approach to ensure all current and future F-5 users can obtain the necessary structure spare parts and systems upgrades well into the future," Matthews added. Northrop Grumman continues to support F-5 user air forces with cost-effective support solutions through the U.S. Air Force (under foreign military sales agreements) and through direct contracts with user air forces. 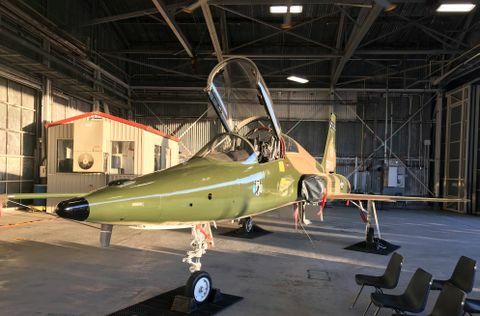 Many of the international F-5 operators are considering (and some have committed to) basic structural life extension programs and avionics/subsystems upgrade packages to obtain an effective lead-in trainer with a modest investment.